"Want to impress your friends? Try this colorful drink that has as much color in it as flavor! Not only does this look fun, it gets even better when the ice cubes melt! Try it also with strawberry, cherry or grape juice." Pour the orange juice into ice cube trays and freeze them. Chill the cranberry juice in the refrigerator. 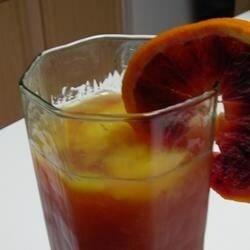 When the orange juice cubes are frozen, Place them in a large pitcher and pour in the cranberry juice. A spiced Cranberry Sangria is perfect for any fall or winter holiday celebration. Good job!My brother and I loved it. Didn't do the ice cube thing but that would probably be cute. By adding vodka or rum, you basically have a seabreeze or cape codder. Good without the alcohol too. Very tasty, great idea with endless variations!